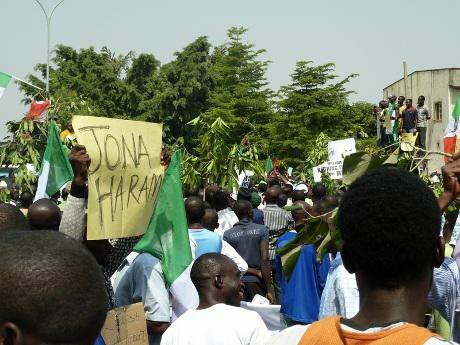 Development plan needed: 2012 protests against Jonathan's removal of fuel subsidies. Demotix / Peter Nkanga. All rights reservedIn May 2013 the president of Nigeria, Goodluck Jonathan, declared a state of emergency in the three northern states worst hit by Islamist insurgency: Borno, Yobe and Adamawa. Nigerian military forces have since initiated a major operation in the north-east aimed at eliminating Boko Haram (“Western education is forbidden”), which has targeted public infrastructures, closed schools, destroyed local economies, killed many people and forced many more to leave their homes. According to the United Nations Office for the Co-ordination of Humanitarian Assistance, since 2013 Boko Haram’s attacks have displaced around 300,000 people. Most have fled to other states, the remainder seeking refuge in neighbouring countries. Recently, the government relief agency, the National Emergency Management Agency, declared a humanitarian crisis affecting more than three million people. Yet the group has shown remarkable resilience and even intensified its assaults. Apart from a deteriorating economy, poor basic services and rampant corruption, the north suffers weak education and few job opportunities. According to the United Nations Economic, Social and Cultural Organisation, the number of children in Nigeria without access to education increased by 3.6 million between 2000 and 2010, and one in six (10.5 million) do not attend formal schooling. In 2008 half of northern children did not attend school and matters have since deteriorated: in Borno all secondary schools have been shut down, affecting 120,000 students. Neglect has also allowed a misappropriation of education facilities—in particular the Almajiri boarding schools, whose teachers preach fundamentalism and instil hatred towards the West, making them a fertile ground for violence. Against this backdrop, in November 2013 Jonathan inaugurated 64 fully-equipped Almajiri Model Schools, aimed at including out-of-school children in the system. The federal government designs the curriculum, provides teaching and learning materials, develops teachers’ capacities and guarantees sustainable food. Once established, the schools are handed over to state governments and monitored to ensure compliance with minimum academic standards. Some members of the president’s security team, instead of targeting Boko Haram youths with brute force, are seeking to enrol repentant militants into vocational schools, where psychologists will give counselling and a “pacifist” version of the Qur’an will be taught. Such programmes will only bear fruit in the long term and only if implemented alongside sustainable economic development. Federal and state governments need to safeguard the functioning of these schools while improving security, reducing corruption, promoting investment (including in infrastructure) and allocating resources more fairly. Genuine political commitment is crucial to address the root causes of the violence and instability that has ravaged the region. Internally displaced persons (IDPs) should also be targeted by government policies. Guaranteeing basic living conditions and providing vocational and entrepreneurial skills may pre-empt large numbers of youths becoming susceptible to Boko Haram’s appeal. Nigerian authorities need to adopt a national legislative and institutional framework on IDPs, possibly based on the Kampala Convention of 2009, which guides government, donors and humanitarian agencies in preventing displacement and promoting the welfare of those displaced. Boko Haram members have found safe havens across the long and porous north-eastern borders with Cameroon and Niger. Open confrontation has been avoided by the authorities and military hostilities would almost certainly worsen the situation. Although the group confines most of its activity within Nigerian borders, however, the possibility of a shift towards international jihadism should not be discounted. Neighbouring countries would then likely face a direct threat to their fragile stability. This needs to be pre-empted by improved border security, through effective intelligence and policing—as opposed to military force—and, again, supportive living conditions. In Niger, Boko Haram has stepped up its recruiting efforts across the country’s impoverished south-east. National authorities initially played down the threat but to neglect Boko Haram could derail the country—already facing insurgency threats in the north—and Nigerien authorities have beefed up patrols and intelligence, even arresting some militants. Cameroon meanwhile is used by Boko Haram as an operational base and to kidnap westerners for ransom, from which to acquire weapons and attract members or secure the release of detained militants. In both countries, fear of escalating tensions has worked against a more proactive approach on the part of the authorities. It becomes all the more urgent that they strengthen their intelligence services, while guaranteeing public safety, welfare and development—including for the thousands of Nigerians seeking refuge in their territory. Failure to protect the latter would provide an opportunity for Boko Haram to extend its operations, whether by taking advantage of the susceptibility to militancy of the youth in particular or by exploiting the socio-political instability where disgruntled and vulnerable refugees are concentrated. As Boko Haram becomes increasingly unbounded, the neighbours of Nigeria need to place its stability at the core of their strategic thinking. Yet they face their own insurgency threats, have inefficient legal systems, lack resources and are largely governed by corrupt and weak regimes—and so their ability to contain fundamentalist violence is correspondingly reduced. For the sake of socio-political stability in the region, therefore, international assistance should be requested and furnished. International actors with solid democratic institutions, mature legal systems, available resources, “counter-terrorism” expertise and strategic interest in the region should create synergies with affected countries for the sustainable containment of violent non-state groups. The case for international intervention is enhanced by the inability of the Nigerian authorities to quell the instability and avert the unfolding humanitarian crisis. If the state has failed to achieve its traditional role of protecting its citizens, the “responsibility to protect” hoves into view. As a major military and economic African power, Nigeria would almost certainly politicise and so evade such calls for international intervention. In the face of a seemingly irresolvable social disaster yet a reluctance to allow deployment of an international force, however, Nigerian authorities should consider willingly collaborating with the international community—key to exiting the scenario of bloodshed, poverty and underdevelopment. The EU and the US in particular have “counter-terrorism” programmes which, if moulded to the specific needs of affected countries and regions, could bear fruits against non-state violence. Via the Trans-Sahara Counterterrorism Partnership, the US has been providing civilian and military assistance to countries across the Sahel and north Africa. But the partnership focuses almost exclusively on security, weighted against the civilian component. US military support to Nigeria’s armed forces has thus failed to produce the desired results, demonstrating its ineffectiveness if the roots of instability are not addressed. On the other hand the EU, which has recognised al-Qaeda in the Islamic Maghreb—purportedly linked to Boko Haram—as a major threat, has elaborated a Strategy for Security and Development in the Sahel (2011), which makes clear that tackling non-state violence and promoting development go hand-in-hand. The United Nations has also been stepping up efforts to counter instability in the region. In 2013, the UN Integrated Strategy for the Sahel was established, seeking to bring together the disparate responses of governments, the region and the international community. Its key objectives are to make governance more inclusive and effective, build capacities to counter cross-border threats and strengthen the resilience of the Sahelian people. Another positive development was the establishment of the Sahel Region Capacity-building Working Group, comprising countries from the region and other influential international actors—such as Canada, the US and the EU. The international community, in particular the EU and the US, should break with its one-size-fits-all approach, look at each country’s particularities and focus less on external factors. By promoting better governance, greater democratic control and capacity-building, it can open the way to more secure borders, more accountable and efficient local management and socio-economic development. From the Nigerian side, a good starting point would be the lifting of the state of emergency, the withdrawal of military forces and their replacement by police and security forces advised and trained by international actors. This would likely result in less abuse of power—thus addressing part of the popular disgruntlement towards public authorities which has been feeding violence—and, paradoxically, probably drive Boko Haram to soften its aggressive stance in the absence of an immediate threat. Guaranteeing border security would go half-way to weakening Boko Haram’s ability to acquire finance, men and firepower. But without a full commitment by Nigeria and neighbouring countries none will be able to keep this dangerous insurgent at bay. So the international community has to step in—but with reshaped and refocused interventions which address the roots of instability. Success also depends on a long-term, comprehensive, socio-economic development plan for the region, with a focus on skills for the young, job creation and basic infrastructure. The daunting task of rebuilding Nigeria will depend, above all, on Nigerian authorities putting aside political rivalries, tackling corruption and pursuing the public interest. Even if all these steps are duly applied, however, Boko Haram will not disappear overnight. Patience and dedication will be critical.